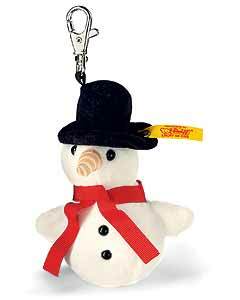 Steiff Keyring Frosty Snowman is made in beautiful soft white plush. Keyring carries the famous Steiff Button in Ear and the yellow tag on his hat. This wonderful Steiff piece is so soft and useful but also an ideal gift to hang on the Tree or as a stocking filler!